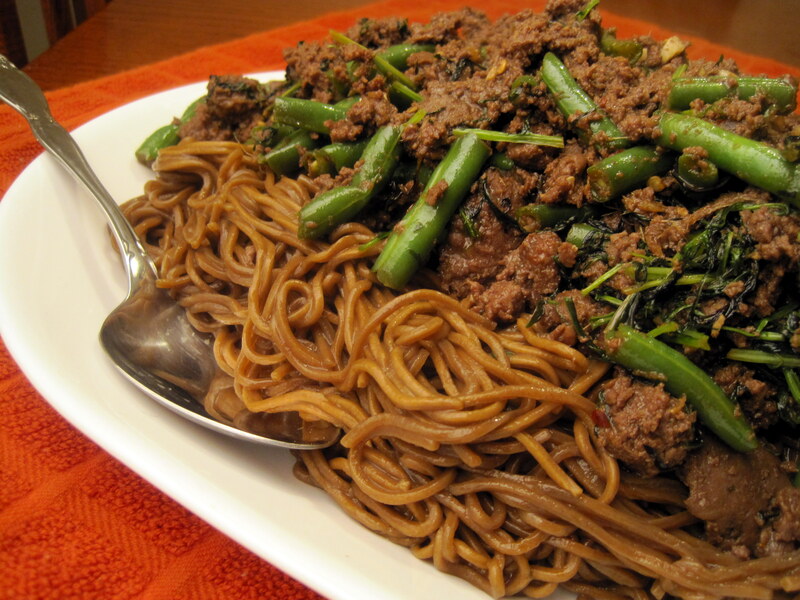 When I was a kid my mom would make a healthy, simple meal with ground beef, green beans, and soy sauce at least once a month. This dish was one of my favorites from childhood, and I started craving it soon after green beans came into season in Central Texas. I found four versions of green beans and beef in my kitchen’s recipe box. Gel’s Green Beans and Beef published by “Angelica” on Allrecipes.com most closely resembles my mom’s version. It’s very mild and a great fit for kids’ tender palates. I adapted that recipe to incorporate some spicier flavors, like fresh ginger and red pepper flakes, and a full pound of the wonderful bitter greens that are so readily available in Austin this time of year. Although I had mizuna in the crisper, almost any combination of dark greens would work well here; the flavor is mellowed by the spicy sauce and beef. A note about presentation: I enjoy eating this meal with brown rice or soba noodles. However, as you can see from my pictures, the result is overwhelmingly brown. White rice or raw bean sprouts would make for a prettier presentation if you’re looking to impress. Snap ends off green beans. Cut off the tough stalks from greens and slice remaining leaves into 1/2 inch ribbons. (The smaller you chop them, the less present they will be in the final dish.) In a large skillet over medium heat, brown the meat. Peel and chop garlic and grate ginger, adding those to the pan as you go. Break up meat with a wooden spoon as it cooks; once meat is browned add soy sauce, honey, water, and red pepper flakes. Bring liquid to a boil and add green beans. Cook for about two minutes, until beans are bright green and starting to become tender. Add greens to the skillet and stir to combine. Cover and cook for about 5 minutes, until greens have cooked down and are very tender. 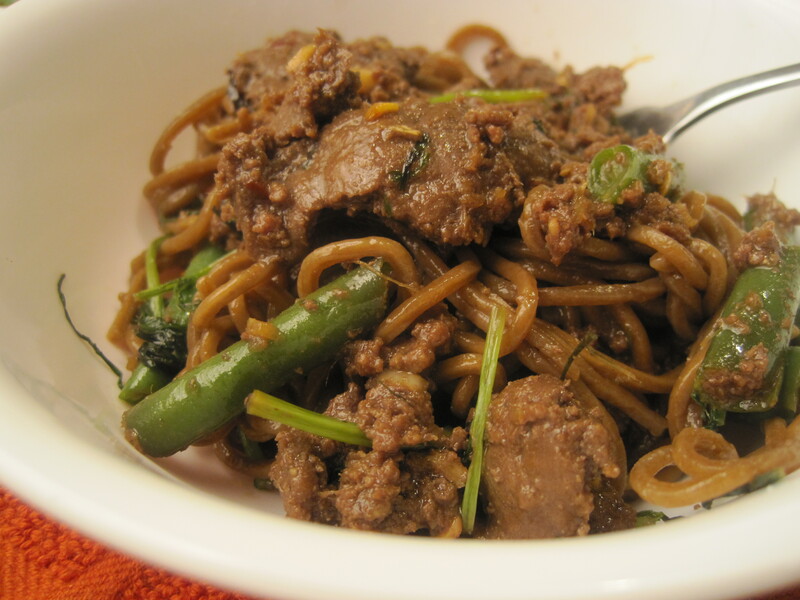 Serve alone or over soba noodles, raw bean sprouts, ramen, or rice. 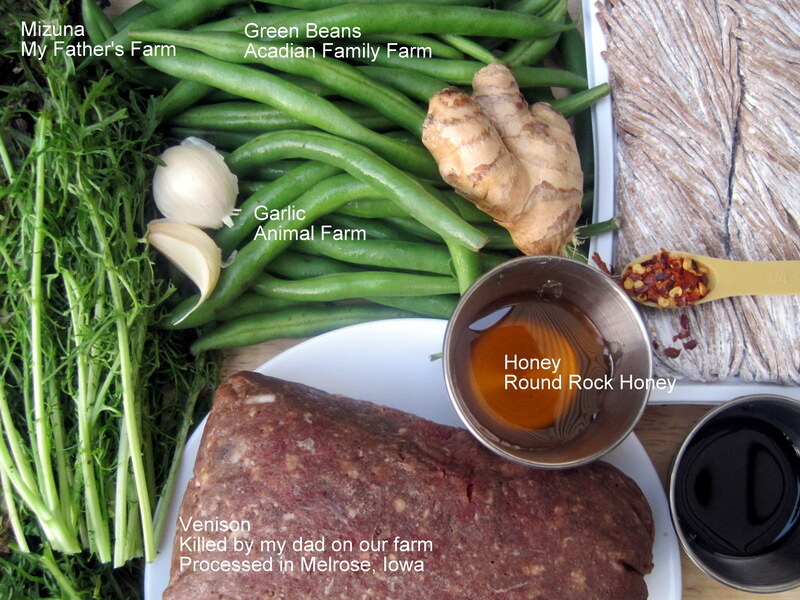 This entry was posted in Dietary Restrictions, Gluten Free, Includes Meat, Main Dish, Vegetables and tagged Beef, Garlic, Ginger, Green bean, Greens, Mizuna, Soy. Bookmark the permalink. I think this sounds really good! Great combination of flavors. Thanks, Lea Ann! I’m loving your blog, by the way. Makes me want some mangos ‘n’ cayenne!